In the rapid development of global economics, energy, environmental & ecosystem are recognized as important factors for sustainable development in human society. The application of measurement and control technology also play a very important role in the utilization and protection of energy and the environment. 2015 International Conference on Energy, Environmental & Sustainable Ecosystem Development (EESED 2015) is a multidisciplinary international conference that provides a platform for scientists, engineers and researchers worldwide to share their ideas and present solutions to energy, environmental & sustainable ecosystem development issues.In the rapid development of global economics, energy, environmental & ecosystem are recognized as important factors for sustainable development in human society. The application of measurement and control technology also play a very important role in the utilization and protection of energy and the environment. 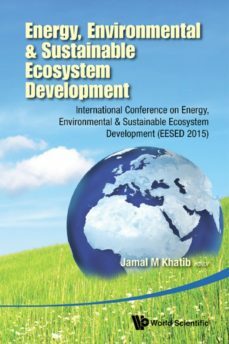 2015 International Conference on Energy, Environmental & Sustainable Ecosystem Development (EESED 2015) is a multidisciplinary international conference that provides a platform for scientists, engineers and researchers worldwide to share their ideas and present solutions to energy, environmental & sustainable ecosystem development issues.Researchers, academics, professionals and graduate students in environmental science.